Running a marathon and working in business – they aren’t that different! Oliver James shares his views on preparing to run a marathon. On the 23rd April 2017, I completed my fourth London Marathon, in a personal best time of 4 hours and 17 minutes. 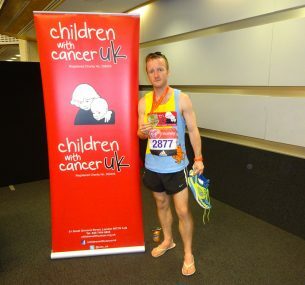 As always, I ran for Children with Cancer UK, a truly amazing charity who do some amazing work. It is always important to be well prepared and maximise your chances of success on the day. Whilst I was doing this it made me think, there are many similarities between marathon running and the working world. When running a marathon, at some point, things will get tough and you have to really want to do it and power through the pain barrier. For me the good cause I am running for always keeps me going and delivering for them is all important. This is also important in your ‘day to day’ work life- It is certainly a help if you are passionate about what you do. 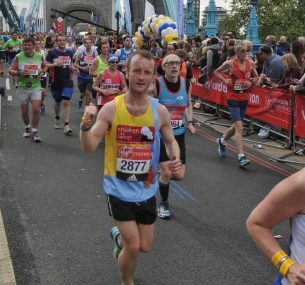 Whilst a marathon is a 26.2 mile run, there is more to it, from training, fundraising, dieting, travel and accommodation. There is a lot to think of to maximise your likelihood of success on the day. When undertaking any work task, having a clear understanding of what needs to be done will help you achieve what is needed. You have to be well prepared for long distance runs. Whilst I am not a fan of the generic plans that are out there (on the basis that every individual is different), you simply have to get comfortable and conditioned with running that distance. That will take time and a reasonable amount of perseverance. In everyone’s busy and varied work life, where you have to get the most out of your working day, planning your time, tasks and being well prepared is becoming ever more important. There is a lot to think about and plan in the months leading up to the race. Primarily training and fundraising, but also possibly more trivial things like having a top quality pair of running shoes. It helps to make a list and prioritise what you need to do and when you have to do it by. SMART (Specific, Measurable, Attainable, Relevant and Timely) objectives will help you here. In almost every job, there is a need to multi task and prioritise. This is so important to achieve your short, medium and long term work goals. Time is always limited and making sure you get the most from your working hours and your spare time will help achieve optimum productivity. It is so important to prepare and give yourself the best chance of success on the day. However, there is always the possibility of something going sideways on the day which you aren’t prepared for. On race day for me it was cramp from mile 23 onwards. In work (and in everyday life) something unexpected can happen and whilst you can’t always prepare for it, you can do everything possible to mitigate the impact. Certainly, on marathon day you need a bit of luck, but you do in life and in work as well. I know there are many sayings about ‘making your own luck’, and I would agree with that to an extent. A bit of good luck can’t hurt. Thanks for reading. 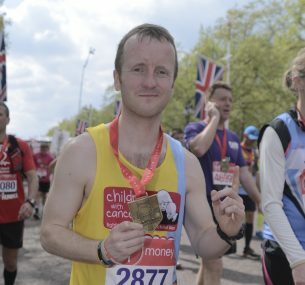 It was such a great experience and an inspiring day, but ultimately the main thing is raising funds on my 8th race for Children with Cancer UK. You can sponsor me via my virgin Money giving page. I would be really grateful and you would be supporting a great cause. Every penny counts.